Harka Bahadur Chhetri, the president of Jana Andolan Party, today said Mamata Banerjee had told him that the two parties should fight the municipality and panchayat elections together as they had in the Assembly polls. Trinamul was supported by the Jana Andolan and the Gorkha National Liberation Front (GNLF) in the Assembly elections. Even though issues in municipal elections are different from state elections, the combine had led in 19 of the 23 wards in Kalimpong, nine of the 20 wards in Kurseong and one ward in Darjeeling during the Assembly elections. While Chhetri contested from Kalimpong, Mamata's party fielded Shanta Chhetri in Kurseong and Sharda Rai Subba in Darjeeling, who were supported by the hill parties. Although the alliance lost all the three hill seats to the Gorkha Janmukti Morcha, the winning margin of Bimal Gurung's party went down by 68.5 per cent. Chhetri, after calling on Mamata today, said: "She told us the same alliance should face the municipality polls and later the panchayat elections," an indication that an anti-Morcha alliance led by Trinamul can be expected to take shape in the hills before the local elections. Mamata did not say anything in this matter today. Election to four municipalities in the hills, Darjeeling, Kalimpong, Kurseong and Mirik is scheduled later this year. The fate of the panchayat elections is not yet known and the last elections were held in 2000. Five years ago in 2011, the Morcha had won all the seats in Darjeeling, Kalimpong and Kurseong uncontested. Elections were held only in five of the nine wards in Mirik where too the Morcha had won all the seats. Mann Ghisingh, the president of the GNLF, has not commented on an alliance with Trinamul in the local polls. A central committee leader of the party had earlier said that an appropriate call would be taken when the times comes. Mamata has already nominated Mann as the vice-chairman of North Bengal Board for Development of Sports and Games while Harka has been made the vice-chairman of Uttarbanga Unnayan Parishad. Chhetri today also spoke with the chief minister about the possibilities of Parishad working in GTA areas, especially during emergencies such as landslides and other calamities. 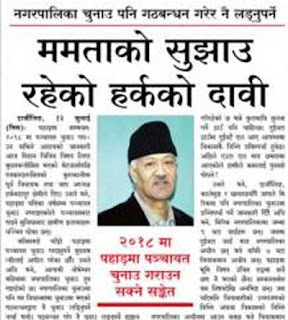 "She has taken note of my submission," Chhetri said. The Jana Andolan leader also requested the chief minister to take a humanitarian consideration on the issue of regularisation of jobs of 500-odd voluntary teachers and at the same time requested that the School Service Commission (SSC) should also be established for the hills. The SSC is defunct since 2003.